Throughout antiquity, there are certain characteristics that describe a sorcerer and his powers, though these characteristics are not uniform throughout. What describes the religious practices of one belief system might be considered hocus pocus for another belief system – for example, what was considered natural magic for the Persians would be considered ritual magic for the Greeks. This perception is, of course, common throughout the entirety of history – one group holds their own rites to be sacred, while putting down their neighboring groups’ practices. From a modern perspective, witchcraft is not only a science, but a way of explaining and making sense out of the world. People of antiquity used religion and magic as the means not only explain the world around them (their macrocosm) but also their internal psyche (their microcosm). Religion and mythology provided a paradigm to answer the common questions people asked. In a very rough, broad distinction, religious practices consisted of a humble/submissive/grateful/repentant practitioner who recited prescribed prayers, offered sacrifices, and enacted rituals, while magic tended to have a more coercive, threatening nature. Religion and magic are based on belief and tradition, while science (including psychology) is based on logic and experiment, though it may never be completely free from myth or prejudice. However, the boundaries between all are not clean cut. Additionally, with the emergence of the scientific practitioners, we get, for the first time, a distinction between the ‘ignorant’ general population and the ‘sophisticated’ urban elite. Magic was practiced not only by the rural population but in the cities as well. Ancient beliefs and modern science mixed in Alexandria to form highly sophisticated occult sciences of astrology and alchemy. Perceptions of witchcraft, religion, magic and philosophy vary greatly according to the author, historical period and cultural text. 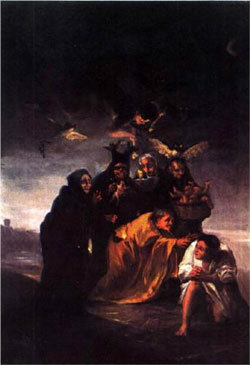 For instance, early Greek testimonies differentiate witchcraft as a secretive, suspect, and even unlawful practice that took place at night and was not connected with any established religion. Those more advanced cultures might view the practices of their culturally primitive neighbors as ‘magic’ Additionally, there are a number of terms associated with magical practitioners that have positive meanings in one culture while maintaining negative reputations in another.